Managing diabetes is a lifetime job, and if laughing may help you manage it better, it's good news! As the saying goes ‘Laughter is the best medicine', a hearty laugh makes you more relaxed and focused. Laughing releases endorphins which are feel-good hormones that provide an overall sense of wellbeing and helps to relieve pain. The immune system is the key to good health and if it is weak, one is more prone to sickness and infection. According to studies conducted by the University of Loma Linda, California, laughter increases the number of immune cells and infection-fighting antibodies. Symptoms such as fear, anxiety, and depression can be overcome through laughter therapy. Laughter also improves healing by increasing oxygen supply and improving blood circulation. 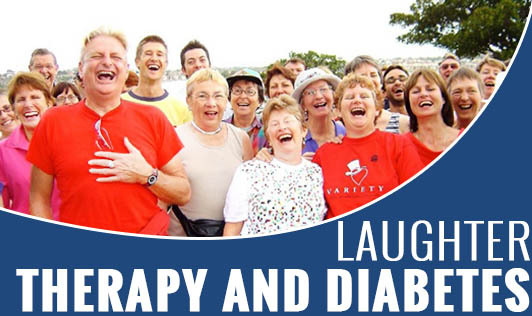 Laughter therapy significantly brings down blood sugar levels and helps in controlling diabetes. A recent study conducted on a group of diabetics belonging to a laughter club concluded that they have better control over blood sugar levels as compared to other diabetics. Laughter therapy is beneficial to other people suffering from depression, cancer, heart problems, and chronic diseases as well. So, join your nearest laughter club to reap the benefits of this wonder drug!